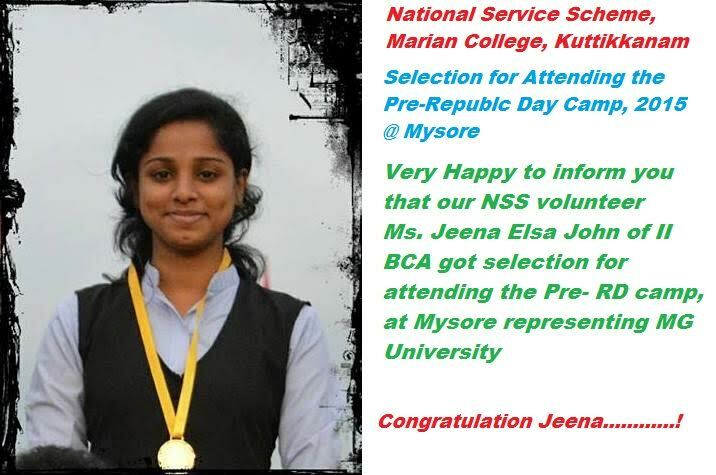 Happy to inform you that our NSS volunteer, Ms. Jeena Elsa John of II BCA got selection for attending the Pre- RD camp at Mysore. Among 150 students from different colleges only 4 boys and 4 girls were selected from the MG University to attend the Pre RD camp. Please keep her in your prayers to get selection from the Pre RD camp for attending the prestigious RD Camp, 2016 at New Delhi.